Marvel Comics ran Pizzazz magazine for 16 issues from 1977 – 1979. 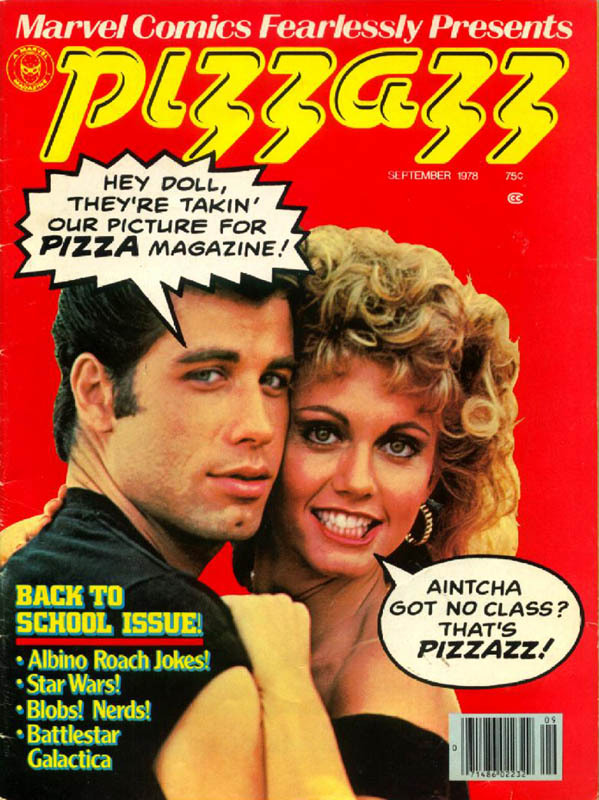 The word “pizzazz” lost its pizzazz in popular media after that time. I fell for this word on Saturday night when it somehow came out of my mouth from literally nowhere during conversation (see dialogue below). Once I said it, I knew I had hit a word nerve. Those nerves are hit when you come across a really cool word. Pizzazz is exactly that: a really cool word. The more I think about it, the more I want to say pizzazz. The z’s in zzazz are important when you say the word out loud. As you can see, all four of those z’s land in just one syllable (play along with me here). FOUR Z’S IN ONE SYLLABLE. Tell me when that happens. Okay, there is zazzle, pizzazz’s 1st cousin. But as you can see, zazzle only has three Z’s! Pizzazz begins so unassumingly with the opening syllable pronounced “pə-.” Like in the word “pedestrian.” It’s unbelievable to me that of all words, the unimaginative word “pedestrian” begins the same way as PIZZAZZ. The accented second syllable lets out a pə-nultimate bang as the “-ZZAZZ” shatters any notion that the word beginning with “pə-” would be dry, empty, and void of pizzazz. What’s incredible is how the two pairs of Zs can be held for as short or as long as the pizzazz-speaker wishes. The longer the Z is sounded out, the more the pizzazz. It’s that simple. NOT ONLY THAT but the A in the second syllable can be said with a Wisconsin “eh” the Philly “uh” the Southern dipthonged “eh-uh” or the British “ah.” Each way it’s said carries with it a definition of its own. With that out of the way, I issue a challenge* to you. This is a real challenge (unlike those fakes ones) so if you’re not up to it, please stop reading and go read something much less interesting. I challenge you to use the word “pizzazz” in your very next live conversation with another human. You can use it as much as you want on social media (Twitter: #pizzazz), which will be too easy to do. But challenges aren’t meant to be easy so I will not count your use of pizzazz in social media as meeting the challenge. Instead, you absolutely must, must, MUST use pizzazz while talking to a person or group. Yes, conference calls are fair game. No, saying it to a telemarketer is not. Again, leave your comfort zone. Do the right thing. Say pizzazz like you mean it. The rules for this challenge? For some accountability, I ask that you please share in the comments*** how you said “pizzazz” in your conversation. Share the reaction from the recipient as well, if any. If there is no reaction, share what you think the reaction was in the hearer’s mind. I expect zero, maybe one comment from this exercise. I groaned slightly, unwilling to admit to her there was no word in the English language that could possibly say what I was trying to say. I was sweeping the floor. She was organizing the spices in the cupboard. But I didn’t know what to say. I was stumped. Words were swimming toward the drain of my mind like bathtub water heading down that whirlpool tornado vortex thingamajig. “From his father, he inherited…” I paused, when suddenly, it came to me. If I ever publish anything more than this beautiful blog, I would love to use pizzazz in a story line. My pizzazz challenge has nothing to do with the ALS ice bucket challenge going around social media over the last few days. The pizzazz challenge may have been inspired by the bucket challenge, though I’m not sure. The only thing I can be certain of is that the pizzazz challenge will not go viral. Challenges are classic conditional logic, where IF you do this, THEN that will happen. Anyway, a San Francisco based company has a pizzazzimatic tool that can help save time between apps. The concept is here. I’d like to do more reviews of pizzazztic companies I follow and pizzazzified services I use. But writing about things like the word pizzazz somehow is more fun for me. Sidenote: I just had to reconstruct this post after I tried to embed a foreign language tweet that used #pizzazz and it deleted 80% of my post. ** I think pizzazz is only generally definable. The word pizzazz is almost more than a word. It’s one of those rare words that says more after it’s said than when it’s actually said. *** Challenges that ask for accountability are extremely annoying and are probably pizzazz counterfeits (or foolzpizzazz).